I voted good, but only because there are eps that are even better. For any other show, it would have been excellent. I think it's excellent -- not as excellent as other excellent episodes, but still really up there. I really love all of G'Kar's stuff in this episode. His flying a fighter craft at Z'ha'dum, the other Narn's sacrificing themselves so he can get away, G'Kar's trying to warn Sheridan and the Council, but their not seeing it as important as G'Kar (and Morden) sees the information. How would Delenn have reacted had she been actively sitting on the Council then instead of being indisposed when G'Kar presented the information, I wonder. 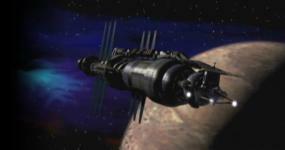 And the scene of the Shadow ship blowing up the Narn cruiser just as it comes out of the jumppoint was great! It's a good episode I suppose, although really its only purpose is to tie up all the loose threads left over from Chrysalis and impose the new status quo. I find the character of Lizzy a little cringe-making, partly because she's completely dropped from the story after this. Her sole purpose seems to be to introduce the audience to the concept of Anna, but it still seems odd that Sheridan only mentions her again only once in 'There All the Honor Lies' (although perhaps not that surprising, given they hadn't spoken for 2 years prior to this). We see the inside of hyperspace for the very first time in the series in this episode!! And it's also the first of Mary Kay Adams' 2 appearances as Na'Toth.. The bit I like most is G'Kar pleading to be taken seriously by the council.. If only they'd listened to him then, perhaps the shadow war would have started prematurely, and billions more people would have died. Poor G'Kar. I totally can't remember it. I'm going to go watch it now again before I vote. C average for me the big downer here is Delenn coming out of her chrysalis and the beginning of her being a human with a partial bone on her head.Sad really she loses almost everything about her minbariness and alieness and it is the beginning here. Solid ep. I, too, am an immense fan of G'Kar's actions in this one -- when he talks to Londo about it you can see just how much seeing the Shadows has matured him. But then that maturity was always there, just a little buried underneath jingoistic bluster. Other Minbari make the same claim. She proves them wrong with her actions in their civil war and by fighting the Shadows when they wouldn't. I love this episode. To regurgitate JMS' own analogy, it's the beginning of G'Kar as Cassandra, warning everyone of the danger to come and being ignored. It's the perfect set-up to the most wrenching, heart-breaking moment of the series to me: Delenn revealing her foreknowledge of the Shadows to G'Kar. Reel shadows of the indigant desert birds. Now THIS is the ep that I can vote a C for because I don't like Sheridan's sister. I thought she was in Points of Departure. I agree that she's the weak point of the ep, especially since sh's never mentioned again, especially when Clark threatens his parents. But I do like him and Franklin saving Garibaldi's life with the alien device.